If you have still not been alerted by my earlier story on the 2010 Annular solar eclipse, here we go again. Today is the day you will witness the longest solar eclipse of this century take place. The annular solar eclipse would be visible in most parts of India but only the southern fringes of the country will see it as an Annular eclipse. For the rest of the country, it would be a partial solar eclipse. 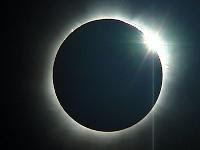 The best places to see the eclipse in its annular from would be Dhanuskodi town near Rameshwaram. If you are already there, wait for the show to begin! The eclipse will last for over 10 minutes in mainland India and can go up to a maximum of 11 minutes 8 seconds in parts of the Indian ocean thus making it the longest solar eclipse of this century. The eclipse starts a at 10:44 am IST and will end at 2:29 PM (IST). This is not the total duration of the eclipse but the range of time different places would see the eclipse happen. Also, it has been reported that The Indian Space Research Organisation (ISRO) will launch a series of rockets from its two centres to study this solar eclipse and its repercussions. These were supposed to be sent out from Sriharikota in Andhra Pradesh and Thumba in Kerala. Annular solar eclipses occur when the Moon is too far to cover the Sun entirely. Therefore, when the eclipse reaches totality, you would see a ring (Annulus) around the moon and hence the name annular. Please do exercise caution while watching this eclipse. DO NOT look directly at the Sun during the eclipse for it might put your eyes at risk even with your cool sunglasses. Also, do not try to use binoculars or telescopes and point at the eclipse directly without sufficient protection as you run the risk of being blinded.